Published: May 2, 2012 at 04:14 p.m. The Lions lost CB Eric Wright to free agency. 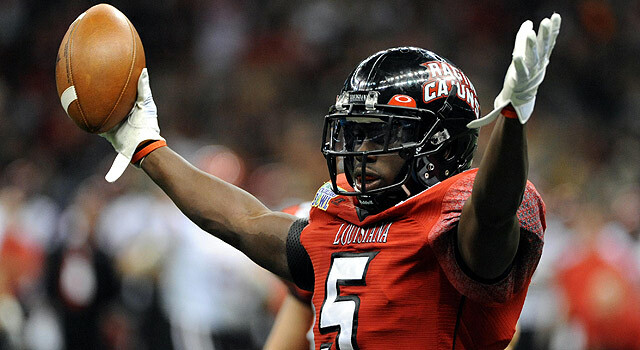 Is third-rounder Dwight Bentley (above) ready to start as a rookie? Free agency: The Bears made waves in March, acquiring two players who could be key contributors in the competitive NFC North race. First, new GM Phil Emery traded a couple of third-round picks to Miami for WR Brandon Marshall. Then he was able to land Michael Bush in the open market, providing an excellent complement to the disgruntled Matt Forte. Signing a quality backup in Jason Campbell was yet another smart move. Draft: Chicago had one of the more surprising picks of the first round, taking Boise State's Shea McClellin to bolster the front four. Alshon Jeffery was good value pick at 45th overall; he gives Jay Cutler a weapon on the outside who can also block in the run game. Tight end Evan Rodriguez could help immediately, while the rest of the draft was devoted to improving the secondary. Holes to fill: The problem with the secondary is the lack of game changers. The back four got much better as last season wore on, but in a division with Aaron Rodgers and Matt Stafford, it's still imperative that Julius Peppers and Co. provide a lot of pressure up front. The Bears are also crossing their fingers that they can go one more year without Brian Urlacher or Lance Briggs going over the proverbial hill. Offensively, Chicago decided to make its bed for another year with J'Marcus Webb at tackle. Now it's time to lay in it. Let's hope for Emery's sake Webb doesn't give up 14 sacks again, or we might see Cutler on the sideline in a trench coat again. Free agency: The Lions stood pat in free agency, allowing CB Eric Wright to walk and relying on the draft to retool. Draft: Detroit addressed a weakness at tackle, drafting Iowa's Riley Reiff 23rd overall. You'll be seeing him on the field soon. Second-round pick Ryan Broyles was a bit of a shocker, as most analysts had him going a round (or two) later, not to mention the fact that this team has more pressing needs. Detroit fortified its back seven, which was expected, spending no less than six picks on linebackers and defensive backs. Third-round CB Dwight Bentley is the best of the bunch and could be pressed into starting duties as a rookie. Holes to fill: Trading up in the second round to get a quality defensive back would've been logical, considering the Lions' secondary got demolished down the stretch last season. The Lions sorely need a playmaker at corner. Sure, they snagged Bentley in the third, but why not address the position in the second round, too? Because they didn't use free agency to help in said area, Louis Delmas must stay healthy in 2012 and the kids had better be ready to play. At linebacker, Justin Durant and DeAndre Levy need to be better than serviceable for the Lions to become real contenders. It's understandable that GM Martin Mayhew and head coach Jim Schwartz didn't invest a high pick on a running back after doing so in each of the prior two drafts. That said, Jahvid Best and Mikel Leshoure are unproven commodities at this point because of injuries. Free agency: GM Ted Thompson doesn't really do free agency. Like, at all. But he ventured off path a little this year, signing veteran Jeff Saturday to replace the departed Scott Wells at center. He also acquired Anthony Hargrove to bulk up the front three, but Hargrove has been suspended for the first eight games of the season for his role in the Saints' bounty scandal. Draft: Thompson and staff wasted no time fixing a defense that allowed the most yards in the NFL last season. The first six picks were spent on that side of the ball: DE Nick Perry and DT Jerel Worthy are expected to contribute immediately. CB Casey Hayward, taken 62nd overall, might be the most interesting pick, as Charles Woodson is getting older and Tramon Williams is getting cruddier. Holes to fill: On the subject of the secondary, Nick Collins will certainly be missed. The Packers released the veteran safety due to lingering concerns about last September's season-ending neck injury, and his absence leaves a huge void in the defense. After Collins' injury last season, safeties Charlie Peprah and Morgan Burnett really struggled (though Burnett is still young with room for improvement). That's one of the reasons Thompson selected Jerron McMillian out of Maine 133rd overall. Avoiding the running back position in both free agency and the draft was curious, as an effective ground game would take pressure off Aaron Rodgers, forcing opposing defensive lines to blink before just taking off to go pummel the All-Pro quarterback. Lastly, with Chad Clifton gone, can Derek Sherrod hold the fort at tackle? Free agency: The Vikings acquired TE John Carlson, CB Chris Carr and WR Jerome Simpson in what was a relatively quiet offseason, while saving some dough in releasing G Steve Hutchinson. Draft: GM Rick Spielman and his cohorts picked up some immediate starters at Radio City Music Hall. Pencil in Matt Kalil at left tackle. Ditto Harrison Smith at safety. Third-round CB Josh Robinson should be in the mix from Day 1. Day 3 picks Jarius Wright, Rhett Ellison and Greg Childs could make an early impact, considering the Vikings' dearth of talent at receiver and tight end. Holes to fill: This is an organization that has a plan and is trying to acquire the working parts as quickly as possible -- without being irresponsible. Thus you see the low spending, as well as a pick swap with Cleveland in the first round to get more -- or better -- players (like Smith). Unfortunately, the Vikings still have holes, most notably at wide receiver, where Simpson and Percy Harvin have gobs of talent but inconsistent production. The jury is also out on tight end Kyle Rudolph. With Adrian Peterson's knee issue, the receiving corps is going to have to step it up, as will the offensive line. Despite the selection of Kalil, look for Minnesota to address the line again in the 2013 NFL Draft. After all, the unit gave up almost 50 sacks last year. Defensively, the secondary was given a big boost. But this is still a front seven that can't get much pressure if Jared Allen doesn't make it home. The sack machine (with 22 in 2011) needs help. Still.